I can't believe how fast the months go by?! 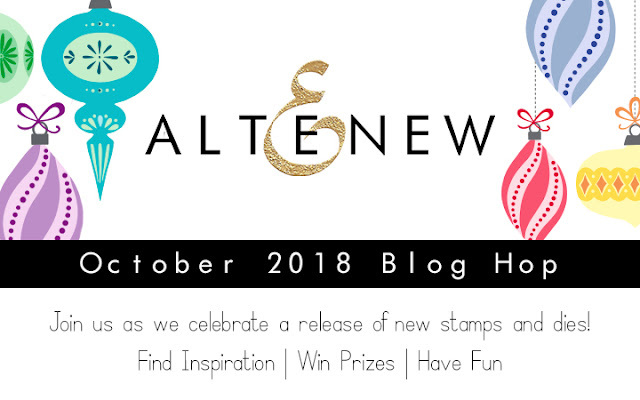 It's time for another Altenew release blog hop woot woot! You should have arrived here from the talented Agnieszka Malyszek 's blog. This is such a wonderful release again, it's hard to pick favorites! 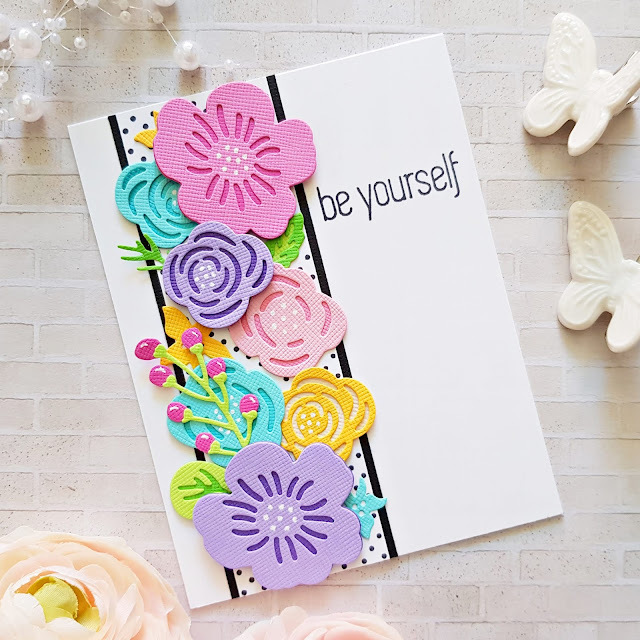 However, the Layered Floral Elements die set has to be one! I paired it with the Dainty Swiss Dots stamp set on these cards. I die cut a bunch of flowers from different colored card stock. I assembled the ones that have two layers. I then stamped a couple of polka dot backgrounds with black ink. I created 3 A2 size top folding card bases. For the first one I cut a strip of black card stock and a slightly smaller strip of polka dot paper, then glued them down on the background. I stamped my sentiment. I just love the font of these sentiments! I arranged the flowers along the strip and glued them down, some with liquid glue, some using foam dots for added dimension. For my next card I used an A2 size panel of the polka dot background I stamped earlier. I glued this on my card base. I stamped my sentiment and created two clusters of flowers in two opposite corners of my card. I still had a small piece of polka dot paper left so I punched a circle from it and added it on top of a larger black circle. I glued these on my card front, then I created a cluster of flowers at the bottom of the circle. Last but not least I splattered black ink all over my card front. Next up is the super pretty Brilliant Baubles set. I created 2 cards with similar designs. The first one I stamped directly on the card front, the second one however I stamped on some white card stock, die cut, then layered on the card front. To finish off the first one, I stamped my sentiment, added some twine and Nuvo drops. On the second I added sequins instead. My goodness, this sentiment though?! Sooo pretty right? I love the hand written look to it. On my next card I've used the itty bitty Poinsettia Pieces stamp set. This is an adorable 2x3" set! I simply stamped a background and splattered some black ink all over it. I cut a circle from white card stock and stamped my sentiment on it. I drew some faux stitch detail around the circle. I trimmed off the right side and using foam dots I glued down the (now) semi-circle. To finish it off I added a grey flower with leaves and Nuvo drops. Next I focused on the gorgeous Peace Love Joy set. I randomly stamped the star onto my background, then die cut an extra one and added it in the middle using foam dots to add interest and dimension. I stamped a bunch of little red bows for an accent color. 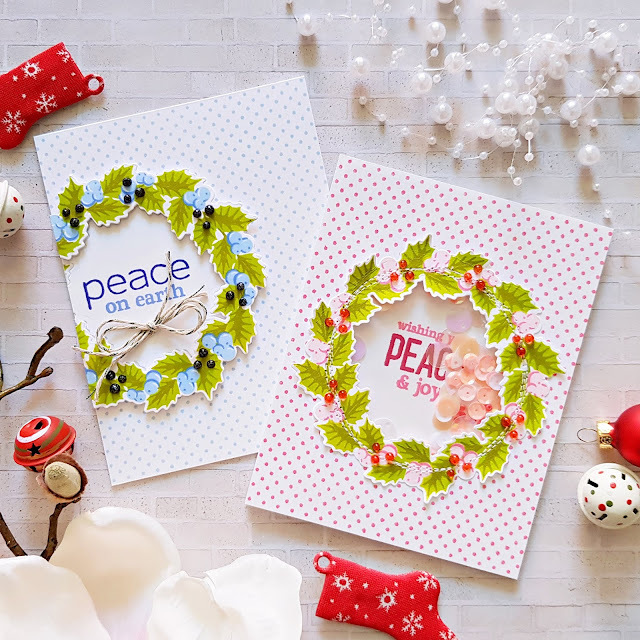 Finally, I made two cards with the stunning Peaceful Wreath stamp set. I stamped a blue and a pink polka dot background using the Dainty Swiss Dots stamp set. I went with a simple and a bit more complicated card. I trimmed off a little from the left side of the circle, and arranged my leaves around it. The second card. I die cut the circle in the middle and created a sequin window. I stamped the sentiment inside that window too. That's it from me today! I hope you liked all the inspiration so far! I'm yet to check the whole blog hop but I'm pretty sure it's full of awesomeness! Now for the fun part, Giveaways, yay! Read on to figure out how you can win! Good Luck! 1. To celebrate this release, Altenew is giving away a $50 gift certificate to 6 lucky winners! Please leave a comment on the Altenew Card blog and/or Altenew Scrapbook blog by 10/17/2018 for a chance to win. 6 winners will be announced on the Altenew blogs on 10/20/2018! 2. I will also draw a winner to receive a $30 gift certificate! Same deadlines and rules apply as before. Comment away!!! Thank you all for your lovely comments! I apologize for not answering but I've been having a difficult past couple of weeks. I'll try to do better next time! My winner is mindy1414 - please contact me at mzs6666@googlemail.com so I can tell you how to pick up your prize! Congratulations! Your next stop is the ever so talented May Park! Zsoka Marko ---> YOU ARE HERE! Wow! I LOVE these! I love Altenew's dies so much, and your very first Layered Floral creation melts my heart! I can't wait to try this out myself! Absolutely beautiful! Your cards are lovely, and I was especially happy to see the die cut flowers. I LOVE your cards - especially the polka dots! So cute! Such beauty! Love all of the cards you made. the swiss dot background is on my wish list for sure. You clearly had a lot of fun with this release, and I can't blame you - so many wonderful products! 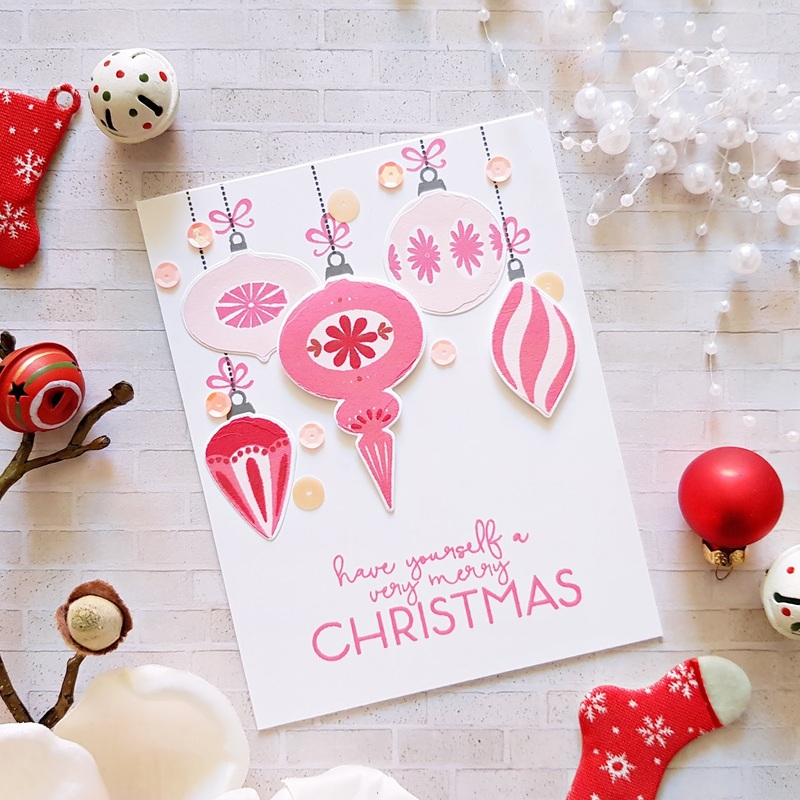 I love your colourful floral cards, and the baubles are so lovely, too - I love the pink version, surprisingly (it's not a colour I would normally go for Christmas designs, but it works!). Your cards are gorgeous!! Love seeing all the variations using one set!! Thanks for the inspiration!! Oh my gosh, your post makes me want all of it! What great samples and inspiration! I was hoping someone would use those dies so I could see how they would look. You made me want to purchase them. This is such a great release from Altenew and you have done an excellent job of inspiring me. Oh my, you have been so busy! All your cards are so wonderful and full of nice, soft color. I am in LOVE with the floral group! They are just what I need on the this grey, gloomy, cold day here in the Northwest! Thank you. Love how you used the tiny dots background stamp. Also, love all your cards, creative and pretty. Thanks for sharing such beautiful cards. Stunning! What an amazing variety and array of beautiful cards. They are beautifully created. You have created a fabulous set of cards!! So beautiful! Great designs. My favorite is the first Brilliant Baubles card. I just love the simplicity and the colors of that one. Thanks for sharing! I love the grey ornaments and your wreaths. Great ideas. Fabulous designs Zsoka! Thanks for the inspiration! Love what you did with these stamps and dies. Great cards. Love the colors on your beautiful creation! These are AWESOME! I love the pink and red for Christmas and the beautiful colors on the floral cards! Love your bright and cheery cards!!! Wow, what amazing cards! Fresh, light, happy and festive. Beautiful designs. These cards are so fun!! I love the new stamps. wow. All of these cards are fabulous. My favorites are the first set of floral cards. So many lovely sets it's hard to pick a favourite but the wreath set is up there. Love the cards. Gorgeous cards! I love the layered stamps and dies. They're so much fun to create with and the results are always amazing. I especially like the cards you made in pink - the ornaments, poinsettias, and wreath! Absolutely stunning! I tried to pick a favorite, but I love them all. Sigh, I LOVE florals. And wreaths! 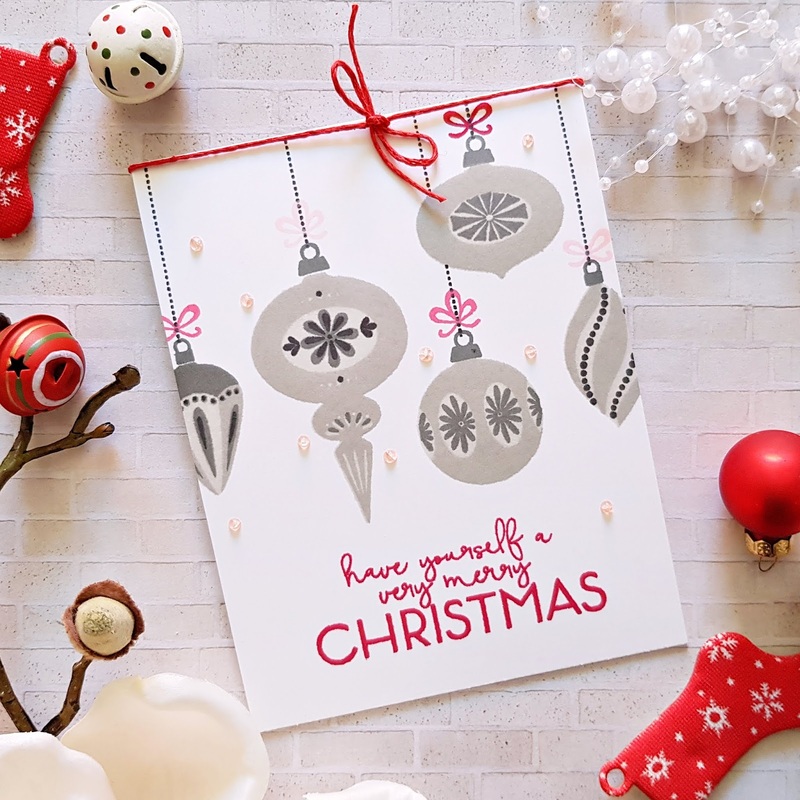 LOVE your layered baubles and all your Christmas cards! Beautiful cards. So unique and colorful. Love your work. Great cards. The shaker card with the wreath is cute and I loved the colors of the floral cards with the black polka dot background. Stunning selection of festive cards, so much beautiful details on every card. You are confusing me as to which my favourite first buy will be . Thank you so showing so many ideas. Love all the non-traditional colors going on with the Christmas cards. And all the bright, happy colors of the floral cards. Wow! These are absolutely gorgeous cards! love all these pastel elegant colors and love all the floral cards. Thanks for the inspiration. anyone receiving any of your cards would be very lucky! Seriously...each card is cuter than the one before! I love all the different ways you have used these products! Love the ornament cards! Awesome work! 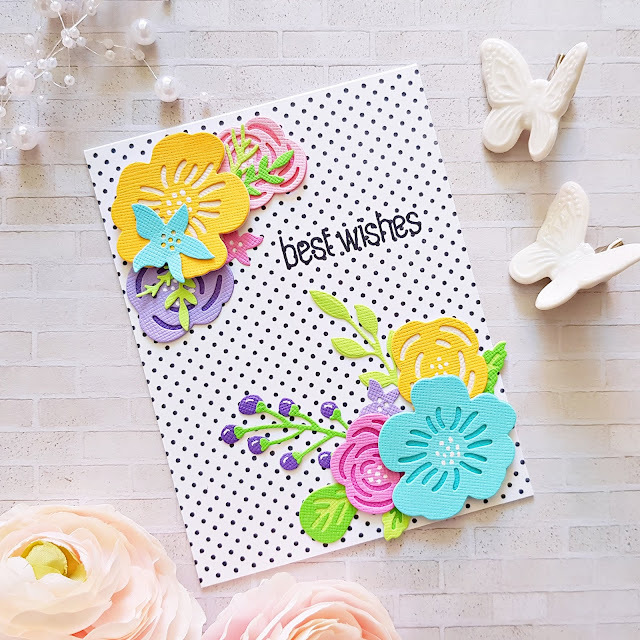 And the flower die cards are great with the Colorful flowers and the dotted paper! Liked all the cards, but the wreath card really is outstanding. Beautiful cards, specially the one made with the Layered Floral Elements die set. This set will be great to use for scrapbooking as well, can't wait to try it out. Wow! I love your bright and cheerful floral cards a lot!! Can I CASE any of them pleeeaase? So VERY beautiful are your Xmas cards, wow! and I love the idea of the non green and red traditional colors! How playful! Your cards are gorgeous! Love how the petite dots enhance the designs! Thanks for sharing! WOW your cards are just stunning!! Love them all! Love your the pink and red ornament combo. Wow. All so beautiful and different. Loving the dots stamp. Very pretty cards! The Floral Elements dies will be a great way to create whimsical flowers with dimension & I look forward to using them. So many beautiful cards!! I am so in love with your cards with the Dainty Swiss Dots and Layer Floral Elements...the B&W with the flower colors!! Oh! I really love the sweet designs and your fresh color choices! I love seeing a fun take on holiday cards! Beautiful work. I particularly like the blue stars on your Peace Love Joy card. Thank you for participating in the Altenew blog hop. Beautiful cards. I love all of them. I'm in love with the flower cards, the colors are so vivid and bright! Thank you for sharing your talent with us! Such a plethora of lovely cards. Those wreaths cards are fast becoming my favorite! Stunning cards. Thank you so much for sharing. Your card designs are so beautiful! I adore the non-traditional Christmas color choices you chose. So inspiring! 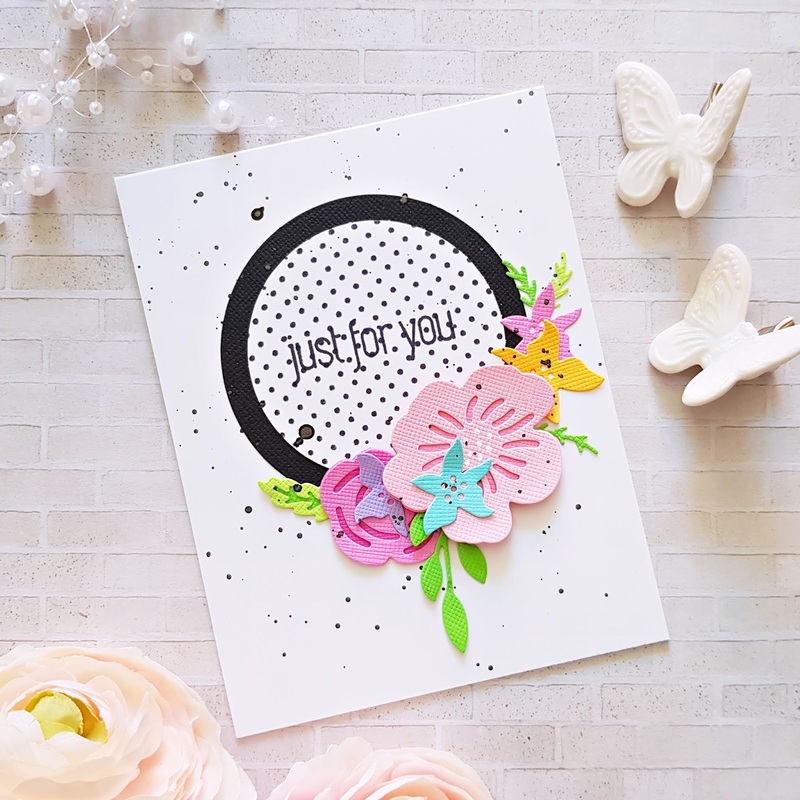 I love how you used those flowers here, and the dotted stamp is awesome----already in my cart! Your Christmas cards are wonderful---the wreaths are my fave for sure. Another stamp/die set for my cart! Thanks for some awesome inspiration! The layered floral elements die set is super! And I love the bright, happy colors you used! And I really like the colors you used on the baubles-these remind me of the ornaments when I was a little girl! TFS! I love your brilliant baubles in pink. Heck, I'm in love with everything you made. I like how you went from spring to winter in your cards. I love me some holiday sets, but it's also fun to see some lighter colors in there too. I also really like your way of doing dimension. You have such a fun way of highlighting your main images. Thanks for sharing with us! What a lovely and varied release with something for every occasion. Especially love those layered bloom dies, the swiss dots background and that gorgeous alphabet. Thanks for the beautiful inspiration! Your cards are absolutely stunning! Wow, so many beautiful creations. I love your color combinations, especially with the bauble cards. Not the colors you would associate with Christmas but they work perfectly. Wow, you used so many of the great new products! I love those layering flowers! Also really like the way you add dimension to your cards. Thanks for sharing! Such pretty cards! My favorite is the ornaments in the gray/silver, so elegant! Your color choices are spot-on! Thanks for sharing! OMG! I was amazed at the flower cards, so pretty with all of those colors on the Swiss dot backgrounds, then came the Brilliant Baubles. Wow! I love how each one had a main color.... Grey.... Pink! So awesome. Then came more fabulous cards. Each so amazingly! You are very talented! Wow wow wow!!! 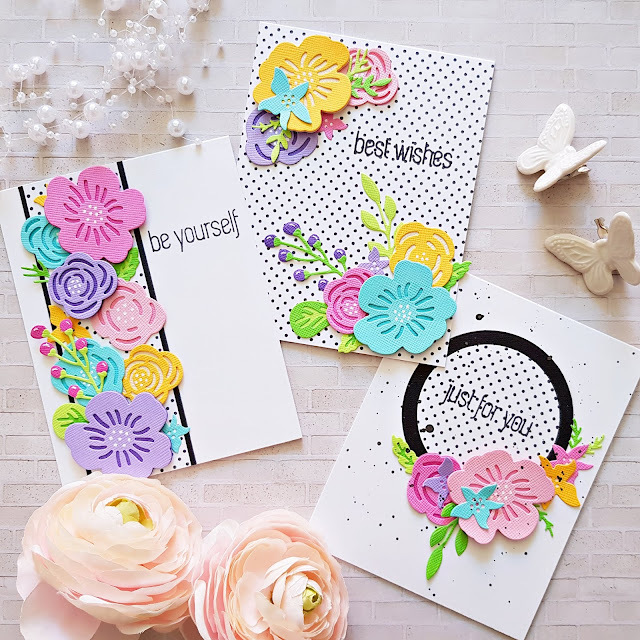 Gorgeous cards... so inspiring!!! fun cards! really luv the wreaths! You have been a busy bee!! All of your cards are beautiful!! Your colors are awesome!! Thanks for the inspiration!! Absolutely blow away by these. The floral cards were my favorite, glorious color choices. Such pretty cards! I love the colours you used for the flower cards! Great job on all your cards, love the colors and style you made. thanks for sharing. Wow! I love the grey and red ornament card! That stampset is definitely my favorite from this months release, thanks for the inspiration! Love your color choices. Such beautiful cards!!! Such eye candy! Your color choices are perfect - I'm in love with those layered die cut blooms. And paired with tiny dots!!! My favorite Christmas card is the lovely one-layer one with the grays and reds. muted colors on the ornaments is great. Bright color is not always needed. Such pretty cards! I love how the different colors change the look of a card. Wow! Love the inspiration cards! The use of color is amazing! Wow, you've been busy playing and what beautiful cards you've brought us!! They are so different in their colours and their designs I absolutely love your layered floral elements cards!! Those bright vibrant colours with the black dainty polka dots go together perfectly! And I love that you used so many flowers. Your brilliant baubles cards are favourites of mine as well. Again your colour choices are amazing and make for some stunning cards. Your creativity is so inspiring! Thanks for sharing it with us! Hi Zsoka! WOW you've been sooooo busy! The cards are all so unique and beautiful. The colors really pop on your top three and your holiday cards are very festive and cheery! Thanks for the inspiration!!! Such gorgeous cards! I am really loving those beautiful ornaments! I'm enjoying all the inspiration along the hop! Your cards are beautiful. I really hadn't taken much notice of the Layered Floral Elements dies before, but you've sold me! Love it. Gorgeous cards!! Love the bright colors you used in the floral ones and the Christmas ones are wonderful! !